Superior quality fast turnaround times, and 21 years of experience is what you will receive when buying a LANshack product. 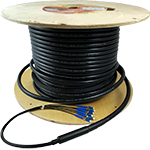 QuickTreX, our line of custom products, ranges from Pre-Terminated Fiber Optic Assemblies, to custom copper cabling lengths, to customized Network Technician Tools Kits. Save time and money on your installation by using a Pre-Terminated Fiber Optic Assembly! Above are two options for a Four Strand OM3 Direct Burial Outside Plant application. This is an application where conduit will not be used, but instead the assembly will be directly buried into the ground. When doing this it is important for the fiber to be protected. We have two Pre-Terminated options available which both offer armored protection. One is a Corning ALTOS fiber optic assembly, and the other is an assembly utilizing CommScope fiber. These are offered at different price points and are both suitable for a direct bury application. Select which fiber you would like to use, then customize to any length and connector option. Lead time is typically 2-3 business days to get your Pre-Terminated Assembly out the door!